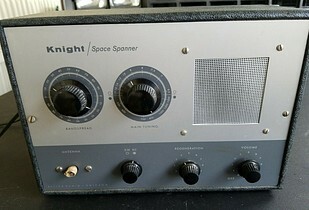 These headphones belonged to James Kasper and came with the Space Spanner from ebay. Allied sold an antenna and a pair of headphones to augment the radio. I was hoping these would be the ones in the catalog. Unfortunately, this headset doesn't even appear in the catalog. 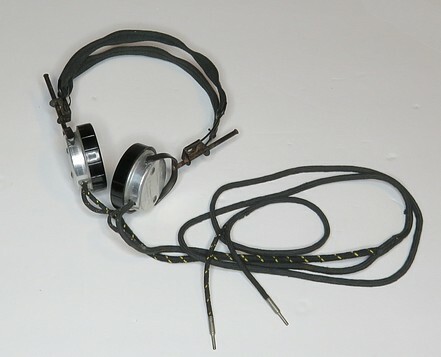 Allied carried CANNON-BALL "Master" and "Chief" headphones in 1957 and '58, but not "Empire." 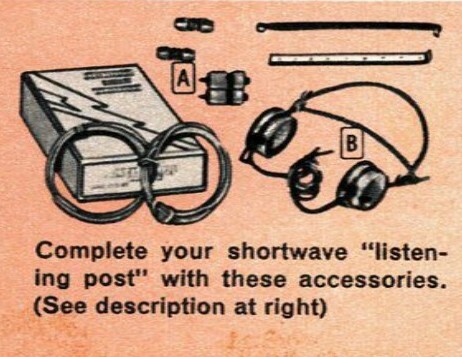 These are the Allied brand headphones sold in the 1957 catalog next to the picture of the Space Spanner. They were $2 and rated at 2000 ohms. 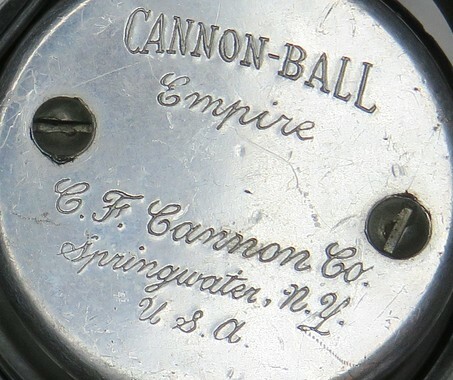 An upgrade to a CANNON-BALL "Chief" or "Master" would cost 22¢ or 44¢ more. 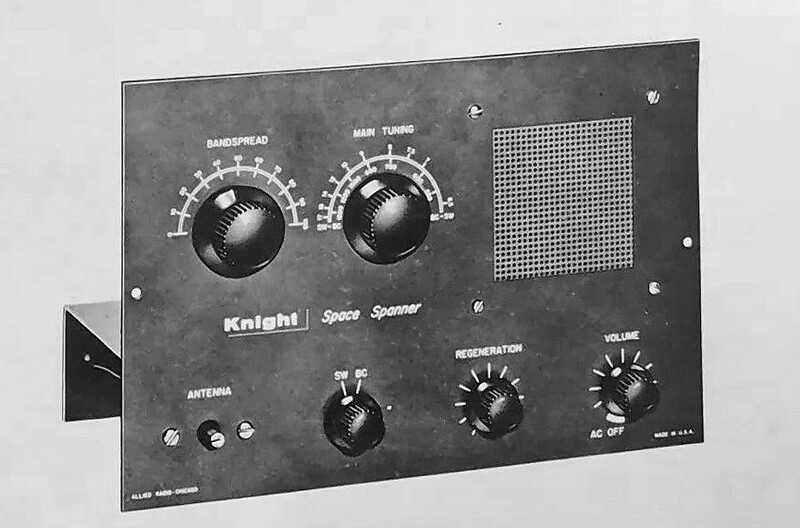 One of the manuals shows the knob missing, but the parts list shows FOUR knobs were included. 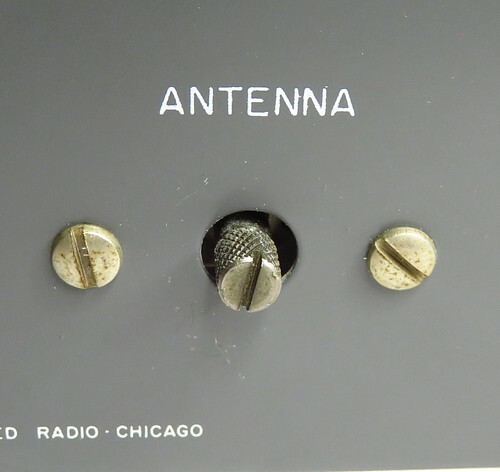 On the left is a photo of the antenna tune control before I cleaned the front panel. 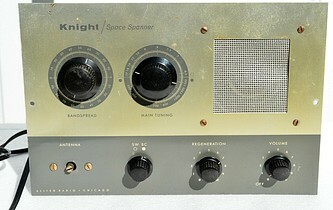 From the mark on the panel, it is obvious that it once had a knob, and the knob came into contact with the front panel. On the right is the answer to the mystery, one of the greatest mysteries of the 21st Century. It's on par with Billy Shepherd replacing Paul McCartney. The mystery has been solved! See that backed out set screw in the picture on the right? It's the answer. The instructions in the manual say to remove the set screw. 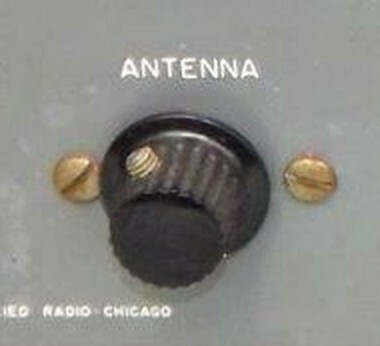 The reason for this is that as you tune the antenna, the shaft on the control moves inward or outward. A knob with a set screw will prevent the control from moving inward when the knob comes into contact with the front panel. 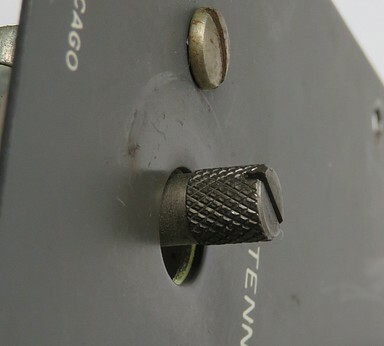 Without the set screw, the knob could come off if the shaft on the control was recessed too far. That is the answer to the mystery. The knobs are missing because THEY FELL OFF. There is no reason why anyone should open the control so far that the knob would fall off, but it was done. One person told me he closed it so tightly he stripped the threads. Old timers, now in their 70s, boast they built a Space Spanner when they were twelve years old. Maybe so, but some of them didn't understand the function of the antenna tune capacitor when they were twelve. At any rate, Allied didn't sell a replacement knob! That makes these knobs very rare. If you want to buy a "Smooth-On" molding kit and mold them yourself, the starter kit and the resin will set you back $50. Can you actually "GENTLY force" something? "I'm going to GENTLY force your hand into the garbage disposal." "I'm going to GENTLY force you to give me all your money." "I'm going to GENTLY force this knife into your back"
It doesn't seem to work in all situations. 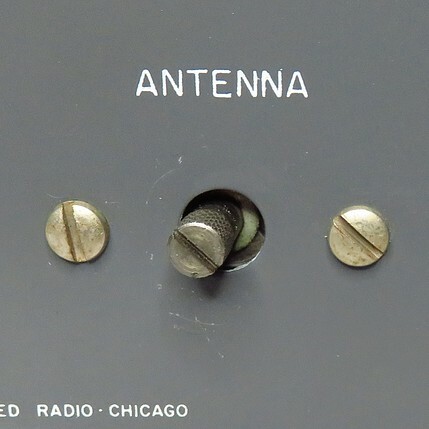 The antenna tune capacitor is not perpendicular to the front panel. It's because of the "ears" on either side, which are the electrical connections. One comes from the front and the other comes from the back. I tried bending them, but they just flattened out again as the screws were tightened. 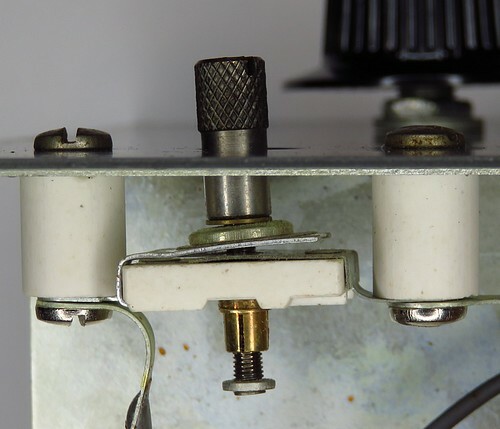 Fortunately, there is no electrical connection with the shaft, so if the shaft comes into contact with the front panel it won't affect the radio. However, we can't have this, the situation is must be resolved at all costs! A quick fix was to shim it with a washer on one side. Warning; The ceramic standoffs are fragile and can be ruined by over-tightening the screws. The big resistor in the filament string (R-11) gets hot. Resistor R-9 is in contact with R-11. The instructions don't describe anything different about soldering in R-9, but the drawing does. It shows R-9 some distance away from R-11. In ten minutes, R-11 reached a temperature of 192°F. Is that a problem? When R-9 was heated by R-11 the value went down by two ohms. 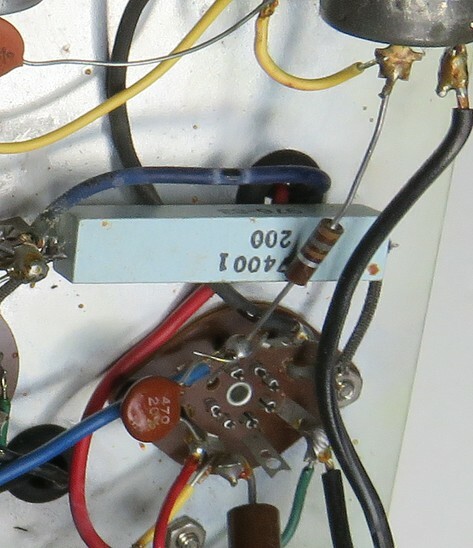 It's connected to the cathode of the 50C5 audio output tube. Considering the schematic calls for a 180Ω resistor (10% tolerance) but R-9 actually tests at 209Ω. I don't think it makes any difference. It's already 11Ω out of tolerance anyway. R-11 was pushed closer to the chassis to put some empty space between it and R-9. Is the Space Spanner the "ancestor" of the Explor-air? The lower part of the fronts are nearly identical. They both come in a wooden cabinet coated in a vinyl wallpaper material. They have the same controls and use the same three vacuum tubes. 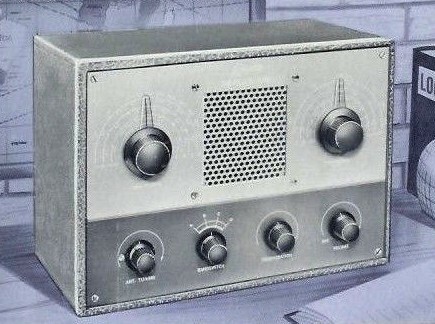 However, inspection of the two shows that except for the tubes and the AC cord, there is not a single interchangeable part in the two radios. The Space Spanner is 1/2 inch wider than the Explor-Air, so the cabinets are not the same. The knobs are similar, but not the same. The values of the volume and regeneration control are different, as is the value of the RF choke. Every major part on the chassis is different and mounted differently. While the style of the Explor-Air seems to be copied from the Space Spanner, it did not "evolve" from the Space Spanner. 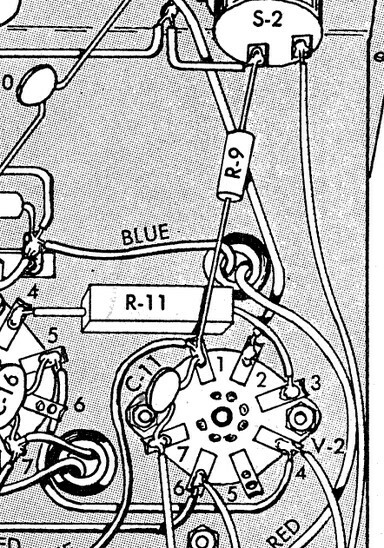 Also, the regeneration controls "feel" different on the two radios because of the way they are wired in the circuit. See the link below to Rich Post's article where he states the KT-135 was the ancestor of the Archer Globe Patrol. 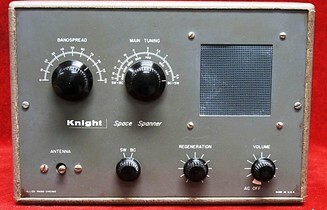 This is part of a discussion on the Antique Radio Forum concerning the Space Spanner. (Beginning of post) ...Anyway, that aside, let's discuss triodes for regenerative detectors. It's often been claimed that low mu triodes make the best triode regenerative detectors. I agree but I add it's a combination of low mu and high transconductance that makes the best triode regens. Gm/mu is the defining relationship, which is of course the reciprocal of plate resistance. So a quick way to compare different triodes and their suitability to be regenerative detectors is to look at the plate resistance data: the lower the better. (By 'better', I mean the tube easily and smoothly goes into oscillation (even with low plate voltage), control at the onset point is predictable, there is no hysteresis, no screeching, no jumping in or out of oscillation, etc). The 12AU7 seems to be the best choice. My experience is that there isn't so much difference between the 12AU7 and the 12AT7, but if I had to choose, I would take the 12AU7. I have made regens with the 12AX7: no problem getting it into oscillation, but control was not as good as the 12AT7 or 12AU7, a little finicky. One tube that I've gotten particularly good results from is the 6/12BE6 pentagrid, triode connected. Mu is 20, gm a fairly high 7200umhos, and the rp only 2.7K. 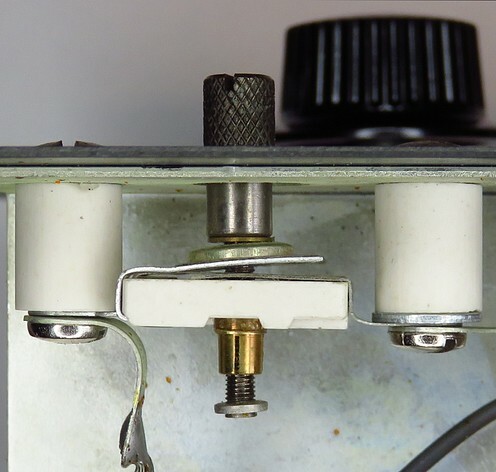 It's interesting to note that this tube in triode connection was used as the local oscillator in the Hallicrafters SX-28, and the company pointed out they chose it precisely for its high transconductance and low mu. The similar 6BY6, in triode mode, works even better (for me). I've also noticed that when I connect a double triode in parallel (mu remains the same, but gm is doubled, rp is halved), it works better as a regen detector. The 6J6 in parallel makes a fine triode detector. One tube I'd like to try in a regen is the 12B4, a triode intended for audio output. Rp = just 1K. Should make an excellent detector. 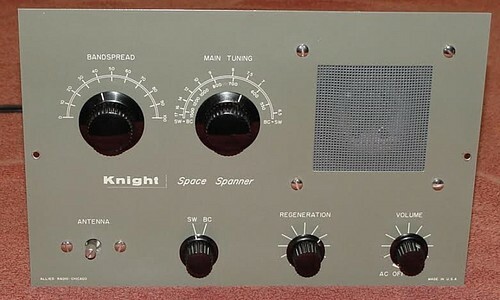 In theory, the best tube for the SS or GR-81 or Explor-Air would be the 12DW7: the 12AU7 section as the detector, the 12AX7 section as the audio amp. In practice, I don't think it would be worth the bother to make the necessary changes. Actually, I stopped using these double triode tubes years ago because they were too expensive. There are plenty of $1 tubes available that work at least as well. 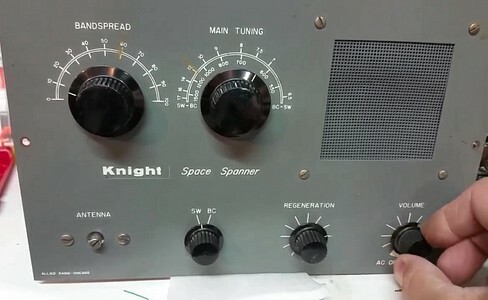 Lanny Conroy built a Space Spanner from scratch here. Big Nick built a Space Spanner from scratch here. 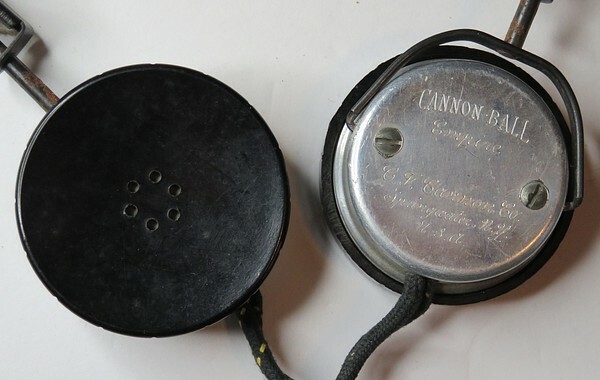 Rich Post identifies a mystery regen radio. (Page 15) here. 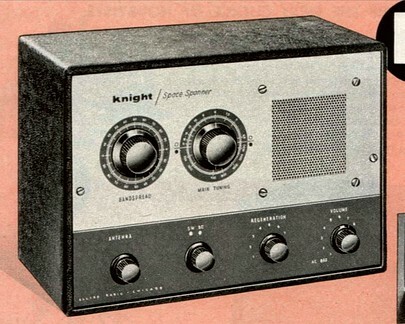 Allied Radio catalogs can be found here. Additional Allied Radio catalogs can be found here.